Today, I tried exploring this stitch some more. 5.Two rows of crested chain stitches are worked together in two ways, the second sample is also laced in this part of the sampler. 6.After working this stitch in a curve, I tried working this stitch on both sides of the chain stitches in the second row, the same theme is extended to work a zigzag version in the third row. 7.I worked twisted chain stitches in the first row, the basic chain stitch is worked between crested chain stitches in the second row. 8.Buttonhole stitches are worked over the crested chain stitch in the first sample, the crested chain is whipped totally and French knots are added in the second sample. 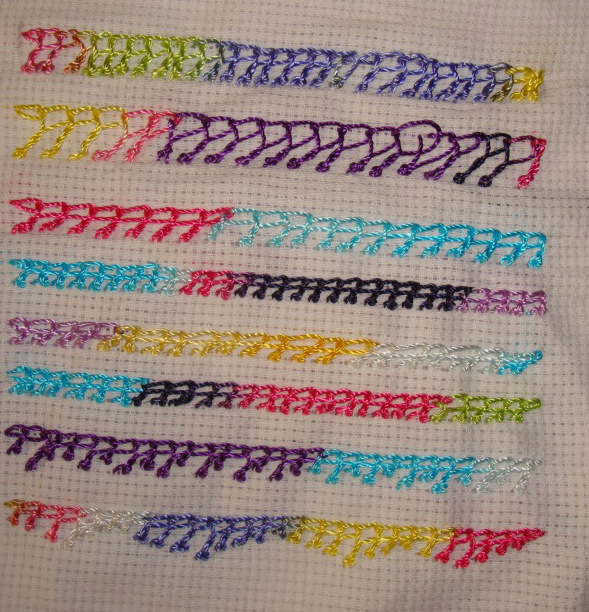 With this the stitch sampler is completed. Working this stitch was not as difficult as I imagined, but working it neatly was a different story. The stitch looked better only in the last few rows. I liked the twisted chain version. 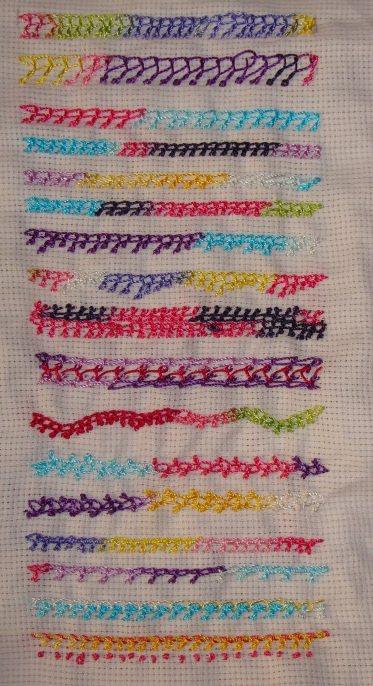 With three more stitches to explore, I chose the 70th week stitch of the TAST 2013 by SharonB-crested chain stitch. I did not try this when it was part of the earlier TAST challenge. 1.I started with the way Sharon had demonstrated this stitch in the first row, the second row was the method shown on A-Z embroidery of stitches-2,[ here the needle passes through a loop held in hand], though the knots are more precise in this row, it is hard to hold the basic chain and the loop together to maintain the tension of the stitch. I am following Sharon’s method from now on. 2.The stitches are worked narrower in these rows. 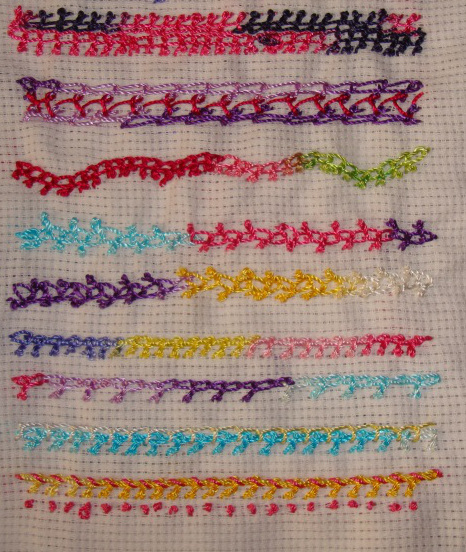 3.Keeping the stitches narrow, I tried extending alternate chain stitches longer in the first row. The needle takes a more fabric for the loop in the alternate stitches in the second row. 4. The stitches are worked in varying heights in these rows.